Educational institutions can order the DVD and book of Fate Did Not Let Me Go for free by emailing info@theollendorffcenter.org. (Please include your educational affiliation and complete contact information). Gifts of the Fate DVD and book to educational institutions are made possible by a grant by the Landon Sawyer Foundation. To purchase the DVD of Fate Did Not Let Me Go, Click Here or call toll free 1.800.723.9479. 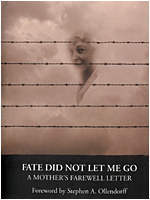 To purchase the book of Fate Did Not Let Me Go, Click Here or call toll free 1.800.843.1724. Download (PDF) version of School Guide for distribution and classroom use here. 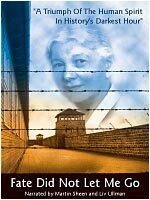 As millions of Americans mark Holocaust Remembrance Day/Yom HaShoah 2015 on Wednesday, April 15, educators are invited to teach lessons of tolerance, courage and hope by sharing the story of a timeless letter written by a loving mother just days before she died in a concentration camp. On August 24, 1942, Valli Ollendorff wrote a farewell letter to her only surviving son knowing that she would not escape her fate in the Thereseinstadt camp. Lost for nearly 50 years, the letter mysteriously arrived in 1985 when her son was 79 years old. The award-winning documentary Fate Did Not Let Me Go chronicles the true story of Valli's letter and its long journey across continents and generations. More than a mother's goodbye, the letter's message of hope and love transcends the tragedy of the Holocaust and stands as a triumph of the human spirit in history's darkest hour. The Ollendorff Center for Religious and Human Understanding has created a free School Discussion Guide with five Classroom Activities (PDF) designed to assist educators in sharing this extraordinary story with their students. The documentary and companion educator guide will help spark poignant discussions about the personal impact of the Holocaust and inspire students to promote tolerance in their lives.